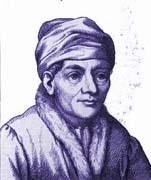 Before we begin to consider the chart of Regiomontanus, we must take a moment to ponder his name. Well really, his pseudonym. Regio was born Johannes Muller von Konigsberg. He had a plain name, but was born and grew up under the Royal Mountain in Bavaria. as scholars were wont to do in those times. as he reformed astronomy and secondarily astrology in the 15th century. might be better translated as King of the Mountain or Royal One of the Mountain. Leo, in itself, speaks of royalty. Placed at the Midheaven, Leo the King is even more accentuated. makes Regio’s name the more pictorial and suggestive. Truly, here was a King of Astrology. You might say, "Neptune wasn’t officially discovered until 1846." Regio either had some inside information, a grand intuition, or other higher inspiration. He undoubtedly knew that his alias was a fit. You betcha! Likewise, Uranus and Pluto weren’t discovered until long after Regio’s death. But, they have quite a bit to say about Regio, as well. Regio’s ability to work with other worlds seems clear. Especially since Pluto is placed on the 9th house cusp. Having Scorpio (ruled by Pluto) at his Ascendant makes the placement of Pluto even more important. Pluto is God of the Underworld and Other Worlds. Sun in Gemini suggests versatility and the ability to communicate and think at many levels. 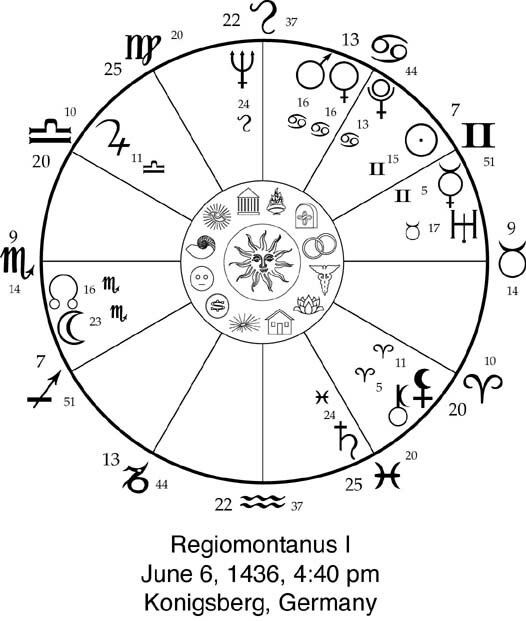 Regiomontanus worked and thought in revolutionary ways regarding mathematics and astronomy/astrology. X - Unusual powers of thought and mind were natural to him. His South Node (glyph not shown) is tightly conjunct Uranus in Taurus in the 7th. These oppose the Dragon’s Head (Wisdom) and Moon in Scorpio in Regio’s 1st. Here again, we have suggestions as to Muller’s ability to reflect (the Moon) Scorpionic-8th house energies. It seems clear that Regiomontanus had advanced Plutonic powers. X - His 11th house Jupiter added to his gifts which he used to resurrect astronomy-astrology. Jupiter is opposed to his Black Moon which helped him shift into working with other worlds. X - Neptune and Pluto are particularly important in Regio’s life because they are focuses of his two T-Squares. Furthermore, Pluto (with Mars and Venus) lies at one angle of a Grand Trine. Saturn and the Moon (North Node) make for the other angles which are all in water (astral) signs. The planets of the Trine are essentially pushed into houses 1-5-9, giving a forceful, steamy sense to his work. and probing scientist who helped point the Middle Ages toward the light. X - Denotes astrological signature.